Time is flying by! Another month has passed and another month of dividends have been collected and put to work in my portfolio. The table below lists what dividends I have received this month. All funds have been reinvested except TROW (the position was removed from the portfolio). This month I have met my original goal with some additional extra dollars. I am slowly creeping towards $300 for all months which will most likely be met by the year end. As it stands at the moment, I am expecting $321 in forward dividends for October (the next quarter). The chart below shows my dividend progress. It is satisfying to see the amount of cash received every month increase. Although I am reinvesting all the proceeds back into the companies that paid the dividends, I can if desired pay for my food and utilities with the dividends so far. The next goal is to pay for my housing costs completely with dividends! Congrats on a great month YD! $300 in total dividends is a great accomplishment, especially for someone your age! 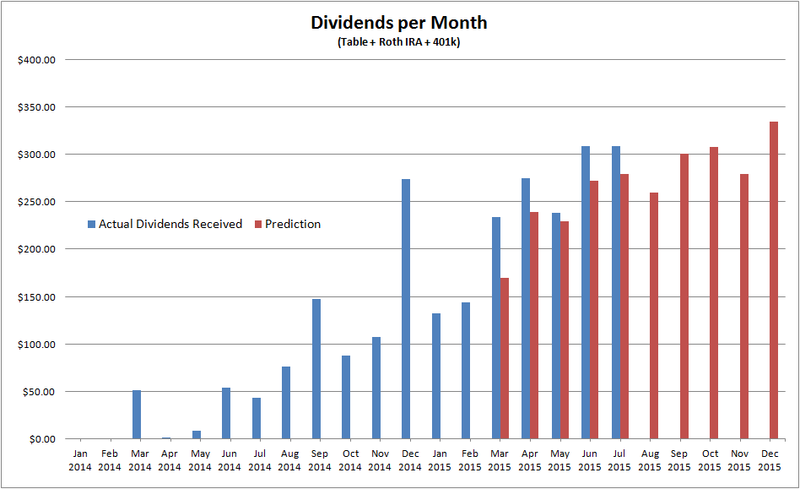 Your dividend payment each month continues to grow quite nicely...your chart is a living testament of the that. Keep up the good work! Thanks for the comment AFFJ! It's difficult to find others in the the young age cohort that have financial independence goals. It's great that we have a DGI community to share ideas.